A very good quality large antique walnut partners desk with well figured matched walnut veneers. Walnut desks and especially large sized ones were never made in large numbers and are therefore very rare these days. 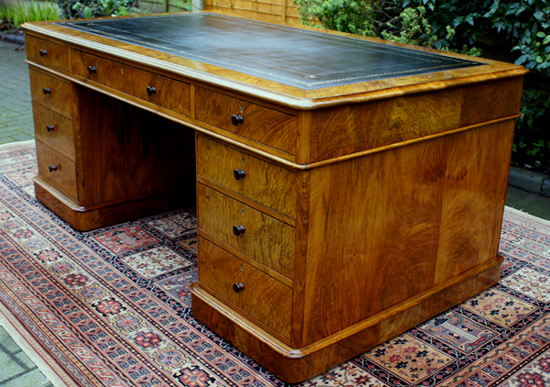 We have had very few and none of this size so we are very please to be able to offer this lovely desk for sale. This desk has beautifully figured walnut veneers and has recently benefited from traditional restoration. Walnut desks and especially large sized ones were never made in large numbers and are therefore very rare these days. 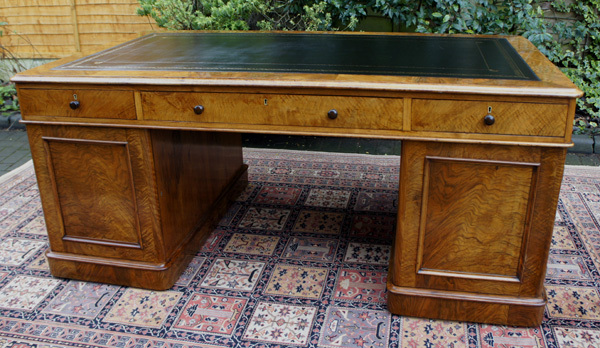 We have had very few and none of this size so we are very please to be able to offer this lovely desk for sale. As will all good quality pedestal desks it is made in three sections, the top and two pedestal, which separate for ease of installation. It has been fitted with a new black hide writing surface with blind and gilt tooling. This is surrounded by a 3 inch band of decorative figured veneer with a 'thumb' moulded edge and rounded corners. There are three drawers fitted to each side of the the top. All drawers are mahogany lined, with hand cut dovetail joints, brass locks and turned wooden pull knobs. The pedestals are each fitted with three drawers to the front and a cupboard with shelf the the reverse. The pedestals have a plinth base with hidden castors beneath. 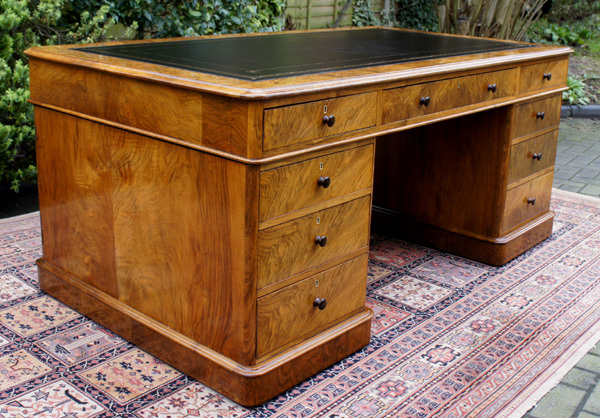 This is a fine antique walnut desk with a beautiful golden colour and would make a fabulous focal point to any office, library or study. Its streamlined and elegant style lends itself to blend easily into traditional or contemporary settings.